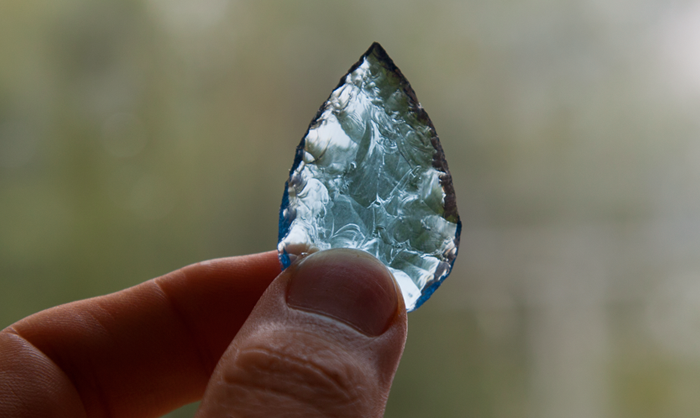 For a while now I’ve been dabbling with stone knapping, which is the art of making stone tools (knives, blades, scrapers and other cutting edges) from stone. It’s been an easy introduction because my mate J.D, who is my teacher is also one of the most accomplished knappers in Australia. I’ve assisted J.D in the delivery of a few workshops and along the way I’ve picked up new skills and ideas to add to my own, and have learned quite a lot about J.D’s passion for busting rocks. So after heading out collecting stones with J.D, learning to identify what works and what doesn’t, and having come to terms with the basics of how to drive flakes off a stone core, yesterday I moved on from percussion flaking, and tried my hand at pressure flaking. I must admit, I’m quite proud of my effort, even if the end result did come after I broke the slab of glass I was working on, twice (hence the finished size of the piece). Anyway, depicted here is the finished result. It’s a bit wonky, and I could maybe touch it up a fair bit more, but I’d like to keep the finished effort in one piece, and it makes for a nice pendant, to give to my wife.